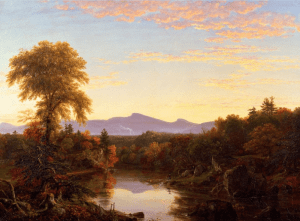 The Thomas Cole National Historic Site has announced the new exhibit “Thomas Cole’s Refrain: The Paintings of Catskill Creek” will be on view from May 4th to November 3rd, 2019. The exhibition tells the story of Cole’s discovery of Catskill Creek, with its Catskill Mountain background, and his ever deepening attachment to it over the course of eighteen years. After the debut at the Thomas Cole National Historic Site, the exhibition will travel to the Hudson River Museum in Yonkers, New York, where it will be on view from November 21, 2019, to February 28, 2020. The exhibition is accompanied by a print publication by H. Daniel Peck in partnership with Cornell University Press. Public programs, including walks and canoe trips along Catskill Creek, are being planned in partnership with Scenic Hudson and Greene Land Trust. The Thomas Cole National Historic Site is located at 218 Spring Street, Catskill. For more information, visit their website. Painting: Thomas Cole, Catskill Creek, New York, 1845. Oil on canvas, 26 ½ by 36 in. courtesy New-York Historical Society, The Robert L. Stuart Collection, Gift of his widow Mrs. Mary Stuart, S-157. I am looking for information on William Mason Brown, a second generation Hudson River School painter.